Never give up. After all, any foreign language is hard for a non-native, right? What was your motivation when you started? You have to keep your dreams. If you can imagine, you can achieve, and you can do. Lépésről lépésre meg kell tanulnia - You must learn step by step :) The Hungarian grammar is complex but logical, once you get the hang of it. I can't really say how difficult it will be for you as I don't know your background. It definitely helps to be used to cases :) As soon as you know the alphabet, you are basically able to read out anything. Yes, but I can generally learn languages much more easily, especially if it's the Germanic one. I live in northern part of Serbia, and there are many Hungarians here. My English teacher (who is half Hungarian) inspired me, because I was so amazed when I heard her speaking Hungarian with her students. She unfortunately moved to Budapest now, but that doesn't matter now. Thank you! I hope I'll have enough energy and motivation to know the basics. I spoke Hungarian as a kid in Canada and lost it slowly after I came to the states when I was seven. I am re-learning it now as an adult and it IS hard. What is even harder is that some of the translators on here (or however it works) make it even harder by not accepting correct translations ie. you have to do it their way and unfortunately it's not consistent. It's been frustrating but I think if you stick w/it you'll eventually learn. Luckily I have Hungarian relatives to bounce this off of and they encourage me. They say it's one of the hardest languages to learn. You can report correct answers that Duolingo rejects. Don't give up! I'm not level 10 but I've seriously been trying to learn for a really long time and am determined to do it (or at least highly improve) this time with Duolingo. The problem is there is really not that many people to practice with. My father is a native speaker so I'm determined.... keep it up. If you practice every day you are bound to pick up the words until you eventually understand what's being said. I think that you should give it a try. I started the course with almost no knowledge of Hungarian vocabulary and grammar (I was just familiar with pronounciation, that's all I knew back then). In the beginning, I felt it was impossible to memorize the words because of the totally distinct vocabulary. So I wrote some important words on a big piece of paper, followed by their Czech translation (it worked for me to also compare the language to my mothertongue). When the paper was full I made an excel-spreadsheet and categorized the words in verbs, adjectives, nouns, etc. After say 20 days of having to look up everything, suddenly I could use a whole bunch of those words. And after 40 days I managed to complete the tree. It is not an easy language, but I was many times surprised by how logical the grammar is, and how intuitive some features of the language are (e.g. vowel harmony). No, you should not give up! You should persist! It's a beautiful language with a lot of logic to it that you can actually really make a lot of progress with fast, once you get the basics. Unfortunately, I don't think this is the right place to learn the basics, at least not right now. This course is haphazard, full of frustrating typos and other mistakes, and leaves out too much important stuff (including any of the explanation that would make the logic clear). Find a good book or audio course that will get you a solid foundation and then maybe Duo's Hungarian is worth something. If you're confident enough with English to use a Hungarian-for-English Speakers book, then I really recommend the book Learn Hungarian by Banhidi et al. It's thorough and yet really well-paced. It is a difficult language for sure, but beautiful, poetic, musical and linguistically very interesting (and from a socio-historical-cultural perspective too). So do not feel discouraged because that is just the way it is. Try FSI Language-Hungarian on Live Lingua Project. You'll learn everything basic and more. I've learned 95% of my Hungarian there. It's long, but really productive. Gonna check it out! Thank you! I don't learn Hungarian but Turkish, which is also an agglutinative language. If you haven't learned a similiar language before, it is quite challengeing. But as everybody keeps telling you, I wouldn't give up either. It is basically a question of motivation. Why do you want to learn Hungarian? Do you have native speakers around? They could help you with the language. Or you could look for a tandem partner on skype. Wow, look I am a native Hungarian (so like level 200 :D) and let me tell you, you just entered the doors of hell by deciding to learn Hungarian. This is one of the hardest languages in the world :D But definitely don't give up! 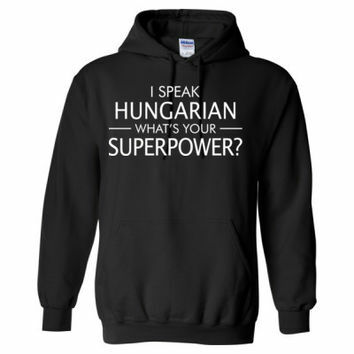 At least you know, that if you master Hungarian, you are capable of doing anything in this world, there is nothing that can stop you. And the other thing is, that the average number of languages spoken in Hungary is 1.5/person, which is the lowest number in the whole EU, so we really need foreign people to speak our language if we do not want to be more isolated. So I really support you, good luck, and do not give up! Hello! I'm curious about something in Hungary. haha that sweater is funny! I really want to go to hungary, but I don't know if I can! haha I understand. Do a lot of people speak english in rural areas?? Never give up. My parents are Hungarian so I learned it when I was young. I can help you learn if you would like. Ok if you don't know or understand something that you are learning. Come here and tell me I will try and help you understand. I would take jsiehler's advice and get a good foundation with Bánhidi's "Learn Hungarian", and then Duolingo is just what you need to practise what you have learned. Just be kind and patient with yourself - Hungarian isn't quite as difficult as people say, it just takes a bit more time. So, whilst there are few words with cognates that you may recognise - the language is a very logical one and you can figure out a word meaning (or at least get an idea) from it's root word. So, learn one word, and you do get several free - the cost of that one word may be higher at the start, but it does pay off over time. For me, learning to focus on the vowels when speaking really helped. I think being an English native speaker, who is exposed to many dialects, you listen for the consonants - things turned a corner for me when I focussed on vowels more and people began to understand me better. There are lots of little tips and tricks with language and with Hungarian - that's just mine. You're Serbian, so that tip may not work for you - just be patient and you'll figure out what works for you. The one thing that works for everyone - practise, practise, practise! Try to use what you have as often as possible. Also, do try to spend time getting away from places where there are lots of tourists and people who speak English (or Serbian). Hungarians in the city can be a bit more jaded than those in regional areas. Those in smaller cities and towns are more interested and have more patience for foreigners who speak a small amount of Hungarian. Good luck with it - with a little patience, you'll find yourself having a lot of fun and adventure as well as meeting some really great people. Try learning Esperanto! It's easy, and it helps you learn other languages. It is hard. I find it difficult to remember because it's unlike other European languages. The Duolingo course is designed with long sentences no one would ever actually say. I need a course with short sentences so I can build up to more complex ones. Does anyone know where I can find such a course? I'd say keep learning, do not give up! The most important thing is to get somebody to practice with. IRL is the best, but online is a close second. If you learn a language with somebody together (but not in a big group—it is better with one or two other people) there can form a kind of friendly and helpful competition. Don't underestimate this! Don't give a sheet to the mistakes! If you make yourself understood, you win. When you can work out the replies, when you can ask easily where is the next bus stop with a ticket machine or a söröző [kinda pub] where they have side dishes, then you can start to be anxious about grammar and other mistakes. But don't overdo that! Actually Hungarians think that our language is one of the three hardest language on Earth (that is wrong, there are way harder languages!). Therefore they will be very pleased if they get know that you learn Hungarian and they will be very helpful. You can ask them to neglect your mistakes or correct them and they will do their best to find out what do you want to say. There are exceptions of course, everybody may have a bad day, but in general you will be welcomed! Get the "music of the language". Every language has one, and if you find out, you're in the cabal. (The next one is the mouth and tongue position. It is different for different languages. But that is a higher level, don't try at your home. Er... Even contrary, try it at your home!) Listen a lot of music on your studied language and try to sing along (avoid instrumental works!). It took me some time. Hungarian is really difficult, and this course is constantly improving. Actually, if it's ever too much for you, I suggest quitting for a while and doing something else, then coming back when you feel a bit better.